What can I possibly add to this astonishing, beautiful day? I just want to recount a few anecdotes on why it means so much to me. But that was both the custom and the rule of those distant days. Personally, I'm glad I got to be with my wife, and to see each of my five children being born. My father, however, had to wait outside, like in the old comedy shows where the Dad is pacing nervously around the room, waiting for the nurse to come in with a bundle and say, "It's a boy!" My Dad wasn't pacing, though. He was reading LIFE magazine's spread on the opening of the Second Vatican Council. Thus, in a different kind of way, he did "see" something pertaining to his new son, something pertaining to the work to which this "John" would dedicate himself in life. It was, perhaps, in some small way "prophetic." Pope (now Saint) John XXIII and the Council he called (from LIFE, Dec. 1962). John XXIII died only a few months after I was born, yet his was a visible figure in the early years of my life. I remember when I was about four years old, my mother -- while folding the laundry -- told me about this "Council," and how many people were spreading confusing ideas in its wake, but that she had read a book by a philosopher who was also a peasant (Maybe I asked, "What's a peasant?" and maybe she said, "it's like a farmer"). My Mom, and many others too, thought that the philosopher-farmer had brought great clarity to the whole situation (and I pictured in my mind some unusual person in overalls and pitchfork: I suspect that Jacques Maritain wouldn't have objected much to this imaginative portrayal of himself). In any case, it was clear that John XXIII's Council had begun something dramatic, and my little heart jumped at the thought that there was this great world of truth. I've spoken about the powerful influence of St. John Paul II when he first appeared in 1978, speaking the words, "Be not afraid... Open the doors wide to Christ!" All through the 1980s he shaped my thinking and experience of the faith, my sense of belonging to the Church, my sense of what life was all about. 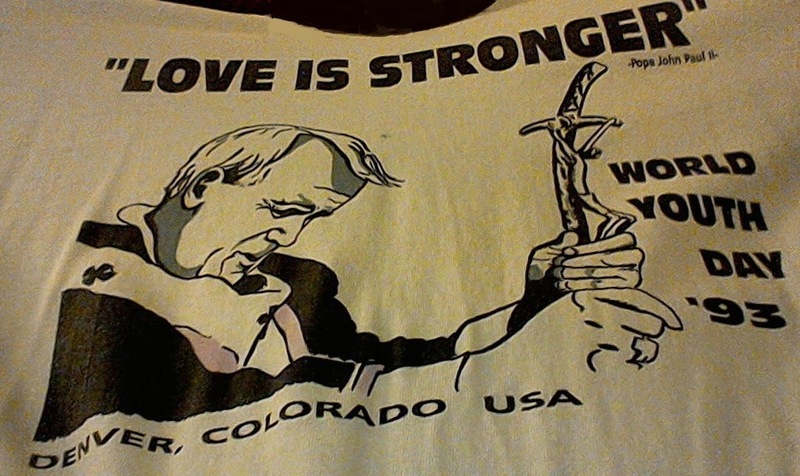 I finally saw him in person in 1993, first in Rome and then at the unforgettable World Youth Day in Denver, Colorado. America put on a "show" for John-Paul-the-Rock-Star, and all of us were ready to be excited by something trivial. But as soon as he began to speak, he took control of this vast crowd. He totally changed the atmosphere, and it was something more than his massive, attractive personality. It was a mysterious Presence that was not him, but that he gave all his energy so that we might recognize and remain focused upon for the rest of the weekend. St. John Paul and hundreds of thousands of young people spent the weekend with Jesus Christ. Those of us who were there will never forget it. Then came that great moment, on July 3, 1996. The young John and Eileen Janaro, on honeymoon in Italy, got "newlywed tickets" to a Wednesday audience. Finally, we met and spoke with this man to whom we both owed so much. We asked him to bless our marriage, and he traced the sign of the cross on our foreheads. We spoke, and he gave us that great, intense personal attention. But there was something I had never sensed (up to that point) from a distance: it was his real humanity, his vulnerability, the frailty that was woven through all his strength. John Paul II really gave himself. He was not "going through the motions." And the most amazing thing was that he didn't hide himself in any way. It mattered to him that he was meeting us; this was a moment of relationship. We were just totally hugging him and saying "we love you" and I felt like he needed that. He too was a human person, and he received and valued the love we expressed to him. The way he responded was totally real; he said, "thank you" and he meant it. John Paul II was our brother, who suffered so greatly on so many levels, and he allowed us to see that. There were few of the symptoms of his physical illness at that time, but somehow he allowed us to see his need, so that we could love him and he could receive our love. For a moment we were "with" him, we were actually "helping him." Mexico, 2002. A saint canonizes a saint. 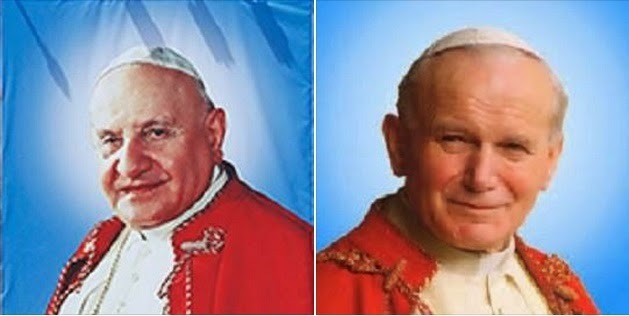 I saw St. John Paul II two more times after that, in Mexico City; first in 1999 and then for St. Juan Diego's canonization in 2002. On the latter occasion some 12 million people crowded into the city and lined the streets of his route to the Basilica. By this time John Paul II could barely move, he was so crippled. 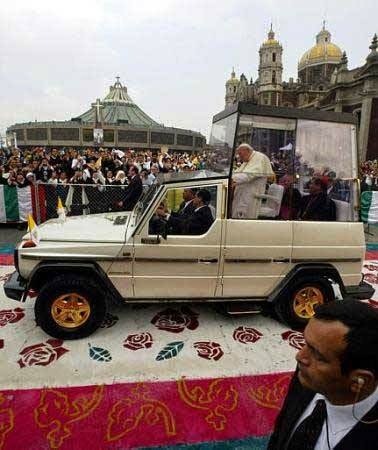 I watched him in that special stand-up popemobile and the love was pouring out of him, and I thought, "this is like he has the stigmata...."
His natural human charisma was crucified in the end. That's when I really knew he was a saint. And now, today, I am full of gratitude to both of these saints of my lifetime. I am grateful for their witness and their intercession. Both, I think, have watched over our family through three generations. Not long ago, St. John XXIII quietly came back into our lives, when Eileen and the kids (and me too) got involved in the work of the John XXIII Montessori Children's Center. 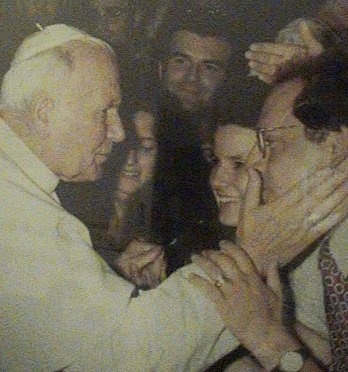 And I know that St. John Paul II is my father and my brother in the Spirit. I pray to him every day. He has been with us through so many trials, and he continues to care for us. I believe that what he has given to the Church and to the world has only begun to be discovered.